Mariana Ancharia is an Imperial publican and the proprietor of the fashionable Cheydinhal Bridge Inn in Cheydinhal. She sells food and rents beds. She is very knowledgeable about what is going on in the upper-class society, mainly due to the inn's increasing popularity among the rich and wealthy, including castle steward Naspia Cosma and Riverview owner Voranil. She also spends a whole lot of time servicing them and can be found behind her desk at all hours except between 9pm and 11pm, when she takes a late dinner on the second floor. In an attempt to meet the standards of the regulars, Mariana has invested in a set of middle-class attire, a russet felt outfit and matching shoes. She carries the key to the inn and a considerable amount of gold. When you approach her for the first time, she will introduce herself, her status and her services: "Mariana Ancharia, hostess of Cheydinhal Bridge Inn. We provide beds and food to persons of quality in the Cheydinhal community." 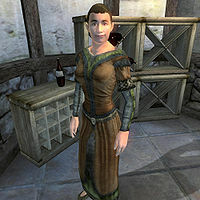 When asked about Cheydinhal, she will provide some interesting facts about both Count Cheydinhal and local artist Rythe Lythandas: "The Count, Andel Indarys, is a Hlaalu parvenu, but his steward, Naspia Cosma, does her best to coach him on the finer points of Imperial etiquette. Our most celebrated citizen is Rythe Lythandas, the famous painter. Speak to his wife, and she might let you take a peek into his studio."